So i got this pack of strawberries and i couldn't think of a better thing to do with it other than making a fruity spread so it wouldn't go to waste due to the fact that the shelf life of the fruit is really nothing to write home about except when frozen. Although strawberries are rarely grown in the country, a few people have taken it upon themselves to fill the need which is definitely a great relief. However, if more farmers could take it upon themselves to make it more affordable, it'd be available like most indigenous fruits and also less expensive. I hear it's mostly grown in jos due to the nature of the soil and the weather, i might need to do a thorough research on more places this fruit is grown. Well, this is by far one of the easiest jams you'd learn how to make. 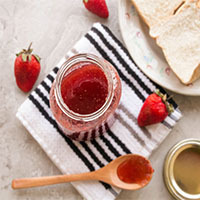 Just like other easy spreads like peanut butter, this homemade strawberry jam is one you'd love. 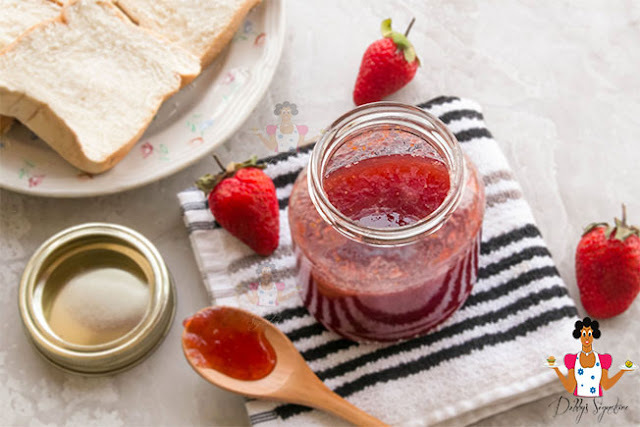 Easy homemade Strawberry jam recipe . Step 1: Rinse the strawberries thoroughly with water and place in a bowl. Once you're done rinsing, chop it into smaller chunks then with a masher or spoon, mash it up. Alternatively, you can simply place the chopped strawberries in a blender and pulse for about 20 seconds. Don't pulse it till smooth. There should still be chunks in it. Step 2: Place a sauce pan on the burner and pour in the strawberry. Add the sugar and leave to cook for about 10- 20 minutes while stirring constantly so it doesn't boil over, till the sugar and strawberry mixture starts to caramelize. You'd know it's ready when you hold up the spoon and the liquid consistency is thick and doesn't drop but sticks to the spoon instead once it cools. Step 3: Squeeze in the lemon juice and stir. The heat and acidity from the lemon helps increase the gelling process. Step 4: Prepare the jar by placing the jar in a water bath and boiling them for about 10 minutes. Remove the jar from the bath and place upside down on a towel till you're ready to use. Once the jar cools down completely, transfer the jam into the sterilized jar. Step 5: Place the seals in hot water separately for 10 minutes till you're ready to cover the jar. Place the open jar back in the pot with water and turn on the burner. Leave to boil for 10 minutes then remove from the water bath. Cover with the seal and leave to cool down completely. By this time the jam would have set slightly. And your jam is ready. Note: This jam has no additional pectin. Pectin is a natural type of carbohydrate known for its gelling and thickening properties and it's found in fruits. Some fruits contain pectin in higher quantities while others contain pectin in lower quantities. These fruits that contain pectin in lower quantities require extra pectin for it to set. 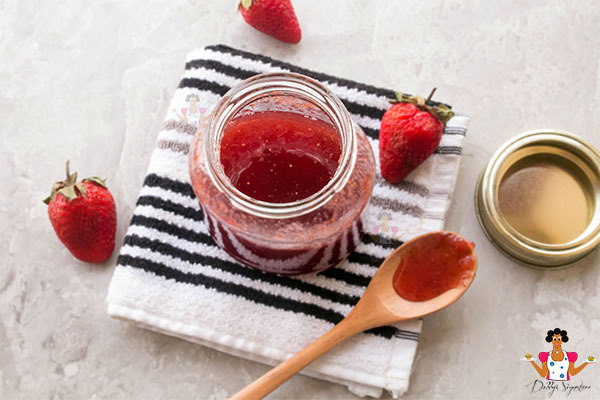 I had no idea making homemade strawberry jam was so simple! This will definitely inspire those of us who want to save money at the pos terminals to spend more time in the kitchen. That's awesome that no additional pectin is required, it makes me curious as to the different pectin levels across various fruits.